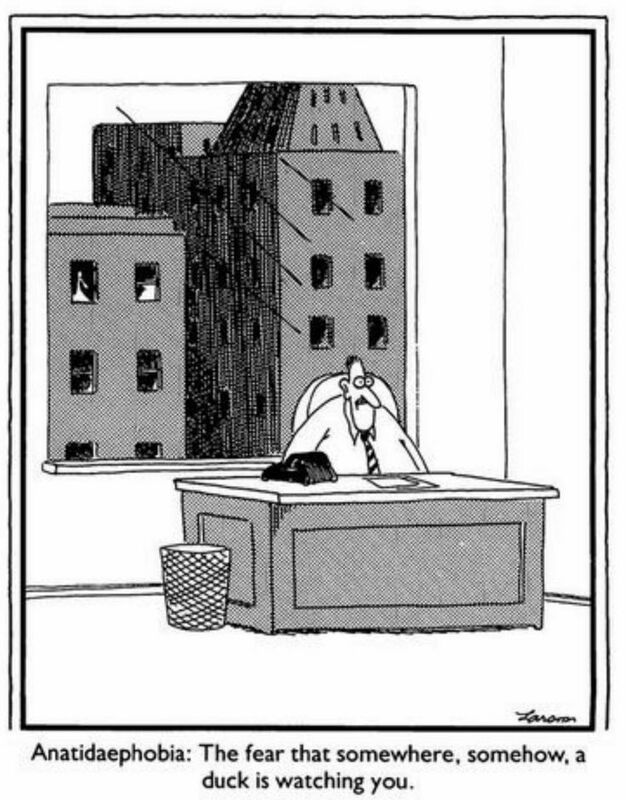 One of the best Far Side comics is one where a guy is sitting at his desk in a nondescript office building, and behind him, across the street in another office building, is a duck, which is staring intently at the back of his head. The caption reads something about a phobia or some junk but really the image of this office worker frozen in terror because this freaking duck won't stop looking at him is all the comic needed to worm its way into my brain for the last few decades. Anyway: Urban Meyer is that duck. In 2019, he will sit in the Fawcett Center, literally across the street from the Woody Hayes Athletic Center, and bore holes into the football practice facility with an icy death stare usually reserved for referees who correctly call false starts on the Buckeye offensive line for the upteenth time in a game. Smith said Meyer will work to develop Ohio State’s other coaches. There are 68 assistant coaches across 36 sports, and they all want to be head coaches. While running the football program, Meyer oversaw a de facto head coach finishing school that was praised by Tom Herman, Chris Ash and Luke Fickell as they went to run their own teams. So Meyer can now spread that to other sports. Most OSU teams have off-field programs like the Real Life Wednesdays done by the football team, a program which brings in professional speakers and helps prepare for life beyond football. Smith said Meyer will assist in those programs, while continuing with the football program. Cool, I guess, although it's hard to see Urban Meyer as a Tony Robbins-type, giving inspirational platitudes to the assistant to the assistant rowing coach. It's a weird situation in part because for the first time since the invention of the atom bomb, an Ohio State football coach wasn't run out of town on some form of rail. Disgrace or dismissal or both makes the transition from one coach to the next actually kind of easy: the necessity of a clean break after a guy, say, punches an opposing player in the throat on national television, or fails to beat Michigan 95% of the time, or lies to the NCAA in a clear and specific violation of his contract means that the next coach that comes in has carte blanche to saunter into the Woody and run things however the hell they feel like. Earle Bruce was a blurry Xerox copy of his predecessor, but Cooper, Tressel, and Meyer all represented a pretty huge departure in coaching philosophy, both in terms of scheme and general approach to the game. It worked for those guys to varying degrees, but they were helped by everyone and their mother hoping that they'd burn everything down and start from scratch. Ryan Day doesn't have that luxury, despite everyone around him insisting otherwise. Day is a great coach and while Gene Smith and Urban might repeatedly insist that Day is his own man, the truth is that Ryan Day is being saddled with not just the expectation to continue the kind of success that Urban Meyer had as head coach, but to do it The Way Urban Did. In other words, if Urban is the duck, then Ryan Day is the guy at the desk. Day isn't Urban Meyer, and won't coach like Urban Meyer. That could lead to friction, both in the athletic department and among Buckeye fans. There are other ducks in the room, too. Larry Johnson, Mickey Marotti, Mark Pantoni, and so on are all there to keep an eye on the new guy. To be clear, these are some pretty competent ducks and will help Ryan Day win a lot of recruiting battles and football games, but... well, they're still part of an old guard that represent the Urban Meyer era. For his part, Gene has said that he'll do what he can to make sure that Ryan Day gets the freedom that he needs to be the coach that he wants to be. Which is great, assuming it works. And there is some college football history suggesting that it can. Chip Kelly was handed the reigns of Oregon by Mike Bellotti, and continued the northwest Nike-aided renaissance that the Ducks (ha!) have enjoyed through most of the last few decades. Barry Alvarez famously stepped aside for coach-in-waiting Bret Bielema (and came back for a bowl once ol' Bert dipped for Arkansas), which, despite our frequent jokes, worked out fairly well for the Badgers. There are other examples, both good and bad, but the point is that it can work. Thing is though, when you have that kind of succession plan, there's an implicit expectation that everything will remain something like 65% the same. And while that's likely to hold true as the Buckeyes move on from the Urban Meyer era to the Ryan Day epoch, who knows how everyone will react when the really big decisions are being made. Decisions like starting quarterbacks. If Justin Fields ends up coming to Columbus, and Tate Martell is left out in the cold by coach Ryan Day, what happens? Does the old guard lean on the new? Or will Day get the breathing room to make his own decisions? We'll find out soon, but hey, at least Urban Meyer won't literally be on the sidelines during gameday, breathing down the neck of the new Ohio State football head coach. “He’ll be on the field at games," Smith said of Meyer. Oh, neat. That seems... great? Or maybe terrible? I really don't know yet, but either way 2019 is going to be fascinating as hell.